The Ink Trap: My First Bellarific Friday!!! Hey, all! Back today with a special announcement. Today marks my first challenge for Bellarific Fridays as a Bella Babe! WOO HOO! Sorry...got a little excited there ;) I'm honored to have the opportunity to join this team and can't wait to color up more of these glorious images. I know what you're thinking..."Enough already, just tell us about this week's challenge!" This week you were asked to Bling it Up. For my card, I chose to work with Uptown Girl Ava Loves to Celebrate. She is a lovely lass and anybody that comes to my house with a gigantic cake like that is alright by me! It's apparent that Ava loves to shine, so I gave her the glitz treatment with a little Stickles around the main image panel, some fancy baker's twine sporting a delicate gold thread, and the piece de resistance, a strip of crystal bling courtesy of my good friend Shay :) She gave me an enormous roll of ribbon and it was nothing but BLING! YOWZA, I think I died and went to heaven! I have so much bling now I might just make the cats shiny matching disco frocks. But I digress...visit the Blogabella blog to see all of the lovely DT inspiration and to find details regarding the next challenge. 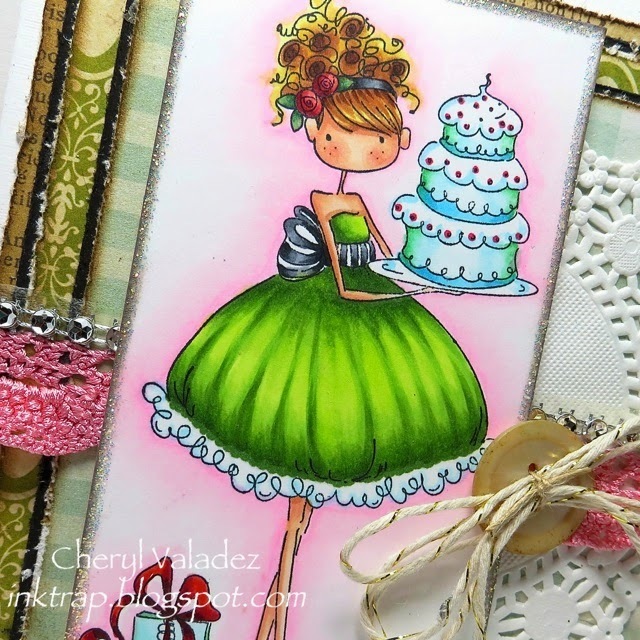 Be sure to play along for a chance to win some fabulous Stamping Bella swag. This card is so gorgeous! Congrats on your new DT - can't wait to see more of your beautiful SB work. Congrats Cheryl! Love these images and you have colored this one up fabulously. Will be waiting on pins and needles to see the disco frocks though! Congrats Cheryl!!! It is SO very deserved!!! You are simply amazing!! 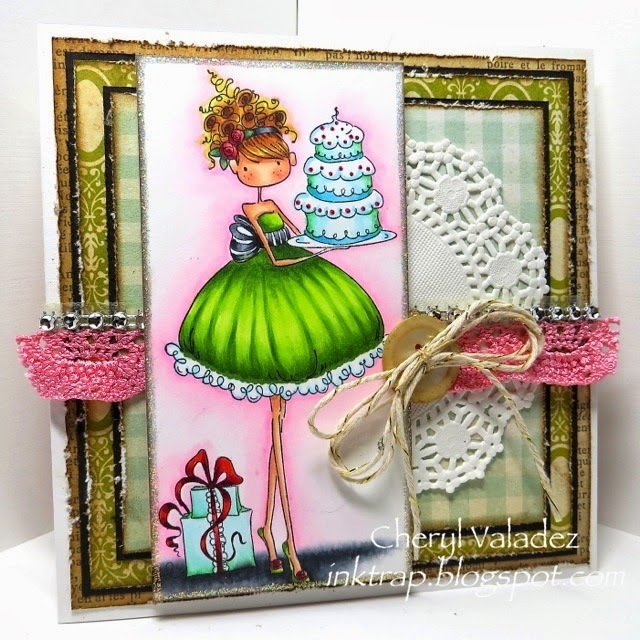 Welcome to the team Cheryl and what a beauty you made for your first card! I adore how you did her hair and love that soft pink shading around Ava and her cake.....yummy! I struggle with colouring cakes but yours is amazing! Congrats!!!! But you are so deserving! Your coloring skills are out of this world! I love the bright colors you use. And your layering. And the glitter. Beautiful work.